We went to peanut factory after visiting tofu factory in Bukit Koman. The Sempalit peanut factory was not far from the tofu factory. If you exit from Bukit Koman Village, take a right turn at the roundabout. Keep going for about 2 km and you will see the peanut factory on your left. The factory was dim and quiet as it is closed on Sundays. Nobody was there except the son of the owner. Even though it was closed on Sundays, he was kind enough to allow us to visit the factory. He was not well-versed in taking us for a tour, maybe he is too young for the job. But we were told that the factory processed China-imported peanuts and packed into 3 different flavors. 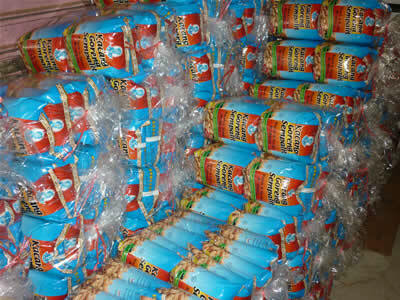 Peanuts are available for sale. Either by bulk (10 packets) or loose. Each packet costs RM2.30. 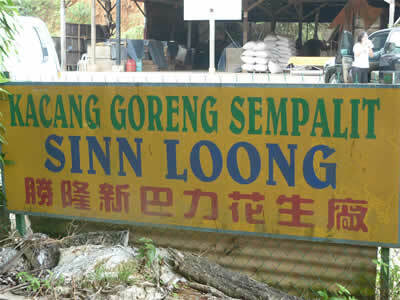 Note: This is the 9th article of A Family Road Trip to Pahang: Bentong, Raub, and Kuala Lipis series.